This article first appeared in the Rushville Republican on March 7, 2017. 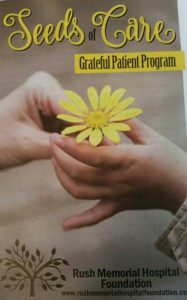 The Rush Memorial Hospital Foundation is pleased to announce the launch of the “Seeds of Care” grateful patient program. This program gives RMH patients, families, guests, and employees an opportunity to honor an RMH employee or department for exception service or care. Seeds of Care flyers are located in every RMH waiting area around the RMH campus and at the volunteer desks. When a financial gift is made to the RMH Foundation in honor of an employee or department the RMH Foundation will contact the honoree to let them know the GREAT way that they have cared, assisted, or helped our RMH guest or patient family. The honoree will then meet in the employee entrance where they will place their thumbprint on a special Seeds of Care tree. The thumbprint will be labeled and the wonderful comment about the excellent service or care will be on display forever. What a special way to honor exceptional RMH employees and inspire the rest to provide the outstanding service or care! Donors can mail in their donations with the form from the flyer, donate online at www.rushmemorialfoundation.com, deposit the donation envelope in donor boxes located at the Admissions desk, 13th street Volunteer desk, MOB volunteer desk, and HCA office. They may also drop by the form to the RMH Foundation Office located at 1230 North Main Street. The RMH Foundation hears so many wonderful compliments about the employees of Rush Memorial Hospital. Now you have an opportunity to express that gratefulness and recognized them for their very special care that is given to our patients, families, and guests. For additional information contact the Rush Memorial Hospital Foundation at 765-932-7568.